A few weeks ago, a group at my church had a pie baking social, and I was searching for something a little different to bake besides the standard autumn apple and pumpkin recipes. I’ve always been a huge chocoholic, so when I found a recipe for a chocolate fudge pie on pinterest, I knew I had to try it. 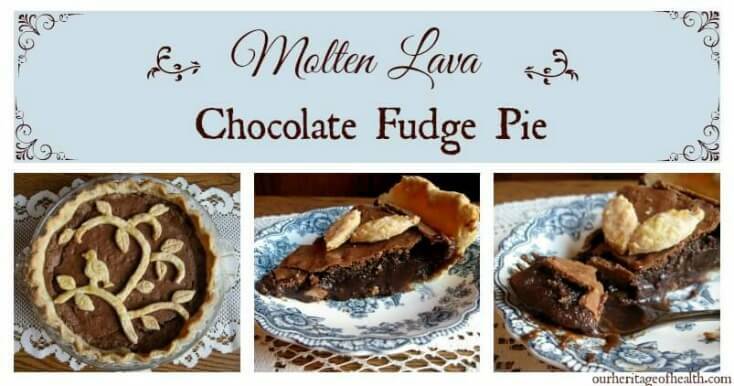 I’m calling this recipe a molten lava chocolate fudge pie because it reminds me of a combination between molten lava cake and a soft, melty version of chocolate fudge. It’s also a little bit like eating brownie batter, only it’s softer and creamier. The top forms a light, crisp crust and when you break into that the inside is smooth, rich chocolate. NOTE: If you want to do any decorative pie crust for the top of the pie, you’ll want to cut out the shapes and bake them separately on a baking sheet and then place them on top of the pie once it has cooled. If you place them on before the pie bakes, the filling won’t bake evenly and rise as well. I dissolved some sugar in water and used that to help seal my pie crust designs onto the top of the pie. Directions: Combine flour and salt. Cut fat into flour with a pastry cutter and then add cold water until dough begins to form into a soft ball. Roll out dough and line a 9 inch pie plate, trimming off extra and crimping the edges, if desired. Preheat oven to 350 degrees. Melt the butter, and then set aside it aside to let it cool. In a mixing bowl, combine flour, sugar, cocoa powder, and salt, stirring until well combined. In another small bowl, beat the eggs lightly and then add the vanilla and the melted and cooled butter, stirring to combine. Fold the wet ingredients into the dry and stir well until fully combined. Line a 9 inch pie plate with your pie pastry and pour in the batter. Bake at 350 degrees for about 30-35 minutes, or until top of pie is set and begins to crack a bit. * The pie will set up some as it cools, so you don’t want to bake it for too long or else it will be more like a brownie than a fudgy molten lava pie. * As tempting as it is to cut right into the pie, you really do need to wait a little while for this one. It’s amazing when it’s still slightly warm, but only slightly warm because otherwise all of the filling will just start to melt out of the pie and you’ll end up with a flat pie and a puddle of melted chocolate in the space where you cut it. It’s absolutely delicious that way, but it makes for a pretty lopsided-looking pie. If you want warm, melty pie, the best way to do that is to cut a slice and then warm up just that individual slice. Have you heard of Dr. Davis and his book titled wheat belly? He explains how unhealthy the wheat of today is. Also sugar is responsible for a lot of health problems. His book was a real eye opener for me. He has some great grain/sugar free recipes. Yes, I have heard of him and about his book. I agree that modern wheat has some problems and that having too much sugar can contribute to health problems, but I don’t personally feel the need to eat a grain and sugar free diet. There’s a lot of debate and controversy in the real food and natural health circles about these topics, so this is an area where I think everyone needs to come to their own conclusions about what is right for them. I believe that there’s a big difference between modern non-organic wheat, though, and heirloom organic wheats, and for most of my wheat consumption, I use an organic einkorn wheat. The way the wheat is used also has a big impact, too, and I typically use the sourdough process for baking to help make the wheat more easily digestible. As for sugar, it’s true that it’s not ideal to eat huge amounts of sugar and that many people have way too much sugar nowadays, but I go by the principle that having some sugar in moderation isn’t really a big deal and that the stress of constantly trying to avoid sugar can be worse than the actual sugar itself can be. 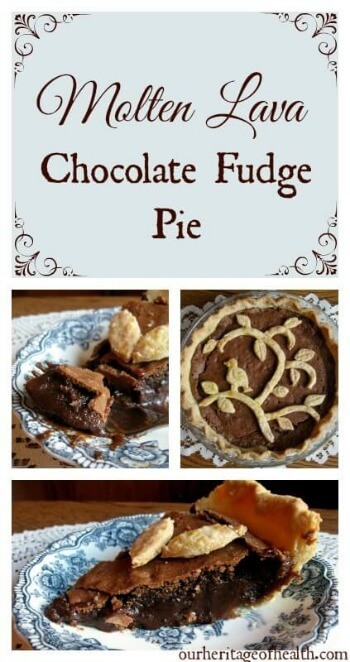 I wouldn’t advise having this pie every day, of course, since it is pretty high in sugar, but for a special occasion dessert, I don’t worry about it. This recipe wouldn’t be good for people who have an intolerance to gluten or who need to avoid all sugar, but otherwise it’s a dessert to be enjoyed in moderation. I personally don’t have a problem with eating foods with grains and sugars, but everyone should make their own choice for what foods are best for them.